The 1953 Argentine Grand Prix was the first round of the 1953 Formula One World Drivers' Championship, which was run to Formula Two regulations in 1952 and 1953. The race was held in Buenos Aires on January 18, 1953 at the Autódromo 17 de Octubre as the first official Formula One race in South America. Previously, the Indianapolis 500 (part of the Formula One championship calendar from 1950 to 1960) was the only Formula One championship race held outside of Europe but run to AAA regulations. Since 1930, the Buenos Aires Grand Prix had been Argentina's greatest motor race. The races held as Formula Libre events at the Circuito Costenara and the Retiro Circuit, until its discontinuation in 1941. Following the conclusion of the war and the resumption of grand prix racing, President Juan Perón announced the creation of the Juan Perón Trophy. Once again hosted at the Retifillo Circuit, the races were considered to be a national sporting event with great significance. Between 1948 and 1950, the event was held at the Palermo Circuit before making a return to the Circuito Costenara for 1951. Whilst the winter waged in Europe, the Buenos Aires races would often mark the beginning of the racing season for many leading drivers. The grand prix driver's would usually travel to South America to compete in Europe's off-season. Argentina's races had primarily been hosted on great road circuits in the city, however at the end of 1951, Juan Perón authorised the construction of a national racetrack for Argentina. The Autódromo 17 de Octubre was completed in 1951 and held its first event at the 1952 edition of the Juan Perón Trophy. The circuited represented the Argentine national Loyalty Day when on the 17th October 1943 the military coup had ended Argentina's Infamous Decade. The circuit had the unique ability to be reconfigured to have multiple different track courses. With the completion of a prestigious new facility, Argentina was given a place as the opening round on the grand prix calendar for 1953. The track would use the number two configuration for the first time, having used the number four configuration for the Juan Perón Trophy. Juan Manuel Fangio's success in grand prix racing was well documented among the Argentine people. Fangio had been a popular figure since even before he arrived in Europe in 1948. He had first gained fame by dominating the great Argentine road races during the early 1940's. Following his crowning as the Formula One world champion in 1951, Juan Perón had begun construction of the Autódromo 17 de Octubre, the following year, hoping the success of Fangio would secure a place for the Argentine Grand Prix within the world championship. After suffering a severe neck injury in the Monza Grand Prix in 1952, Fangio was forced to sit out the entire grand prix season. Leaving his rival, the Ferrari driver, Alberto Ascari, to dominate the season unchallenged throughout the 1952 season. The Argentine Grand Prix, his home race, would mark the return to racing for the Argentine champion. Ferrari: There had been little change amongst the Ferrari squad for the 1953 season. However one notable change was that Piero Taruffi had departed to squad to work in the Lancia sportscar programme. He had instead been replaced by Mike Hawthorn, a young British competitor. Hawthorn, competing in his first grand prix season had impressed all by regularly fighting among the leaders in a privateer mid-field Cooper. With the departure of Taruffi, Enzo Ferrari had offered the rising talent of Hawthorn a place among grand prix's leading team. The Ferrari 500 was still expected to be the leading car of the field, with the exception of the Indianapolis 500, the Ferrari 500 had won every race it had competed in. Alberto Ascari who had dominated the grand prix scene for the team in 1952 was still expected to be the title favourite. Ascari's friend and mentor, Luigi Villoresi remained in the team, as did Formula One's first champion, Giuseppe Farina. Maserati: Fangio would pilot the Maserati A6GCM for the 1953 grand prix season. The car had been introduced the previous year, proving to be the only car capable of challenging the all dominant Ferrari 500. Maserati were hoping to provide a more serious challenge to Ferrari in 1953 with the return of Argentina's national champion. Maserati had further signed Gioacchino Colombo, the engineer who oversaw the development of the dominant Alfa Romeo marque during 1950 and 1951, and former colleague of Fangio, had also signed to join the Maserati team for the 1953 season. He had already conducted modifications to the car's suspension and brakes in order to make it more viable to compete against the Ferrari's. Partnering Fangio at Maserati was José Froilán González, a fellow Argentine and considered a great friend and apprentice to Fangio. González had demonstrated the true potential of the Maserati squad when he nearly defeated the Ferrari 500 of Alberto Ascari at the final round of the championship at Monza. Felice Bonetto, the Italian veteran, had also been retained for the 1953 season. The trio of Fangio, González and Bonetto would complete Maserati's regular line-up.Making a special appearance for the Argentine round of the championship was Oscar Alfredo Gálvez. Gálvez was one of the great Argentine road racers and a former rival to Fangio during his early career. Unlike Fangio and González, Gálvez had opted not to seek further fortune in travelling to Europe to compete in the grand prix's. Remaining as a domestic Argentine racer, the Argentine Grand Prix presented one of the few opportunities for Gálvez to showcase his skills among the great grand prix competitors. Gordini: The Gordini squad would continue with their T16 chassis for the 1953 season. The team hoping an improved reliability record would allow them to mix for regular points finishes in the 1953 season. The team would have an unchanged line-up of French regulars Robert Manzon, Maurice Trintignant and Jean Behra. Making one off appearances for their home grand prix were Carlos Menditeguy and Pablo Birger. Cooper: The Cooper squad had previously never entered the grand prix scene as manufacturers. They had simply sold their cars to privateers who had chosen to compete in the grand prix calendar of their own volition. However the success of the Cooper T20 at the hands of Mike Hawthorn in 1952 had prompted Cooper to trial run as a works manufacturer for 1953. Charles and John Cooper had travelled to Argentina, running a works Cooper squad for the first time. The duo had previously only operated in Formula Three as a works entrant. Debuting their new Cooper T23 challenger was John Barber. Whilst also competing for the team in the older T20 model was Alan Brown and local Argentine entrant, Adolfo Schwelm Cruz. The practice sessions were afflicted by rain in the earlier runs. The weather would gradually improve, however the earlier times provided some excitement as the driver's were forced to get to grips with the slippery track. 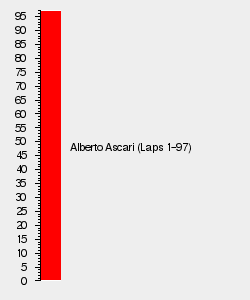 Alberto Ascari continued to assert his dominance, the Ferrari driver taking pole position once again. He was nearly a full second faster than the returning local hero, Juan Manuel Fangio. Fangio, however was afflicted by a transmission failure and suffered two spins on the wet surface. Even Fangio at his home race was struggling to get the Maserati to match the pace of the Ferrari. He nonetheless ran faster than the other Ferrari cars of Villoresi, Farina and Hawthorn. Hawthorn, still adjusting too his new team found that he could only manage sixth on the grid, falling behind the second Maserati of González. The Gordini's of Trintignant and Manzon headed the midfield, whilst local drivers Gálvez and Menditeguy completed the top ten. Behra's Gordini could only manage eleventh, however most disappointing was Bonetto in the Maserati who lined up on the last row of the grid. Bonetto, like Fangio had suffered transmission problems. Reliability was proving to be problematic for the Maserati's. The Cooper's evidently had a lot of work to do, their cars were overall the slowest, Brown and Schwelm Cruz managed to beat only the aged Simca-Gordini model car of Birger and the hampered Bonetto. The final Cooper of Barber was final car to line-up on the grid. "My children, let them in" proclaimed Juan Perón on race day. In a bid to promote Argentina's new championship and grand prix status within motorsport, Perón had declared that the race in Buenos Aires would be free of charge for those wishing to witness Argentina's first championship grand prix. It was estimated between 300 000-400 000 people had come to watch the race. The grand stands were full, however this did not detract the Argentine people. The track had become overcrowded and had suddenly become too big for the small police force to manage the crowds. Spectators were packed into every inch of the circuit, they could be seen packed standing on the edge of the circuit, as well as in very dangerous places such as the exit of corners. There was concern amongst the drivers ahead of the race start. The massive crowd would mean the risk of hitting the uncontrolled mass of people would be very high. Nonetheless, the race start would go ahead as planned and all the drivers had every intention of competing in the race. Ascari got a strong start in his Ferrari, his chief rival, Fangio, was slow off the line upon his return to racing. The second Ferrari of Villoresi, was the fastest starting of the leaders, he would challenge Ascari into the first corner, however he outbraked himself and allowed the Maserati's of Fangio and González to overtake him. Before the end of the first lap, Bonetto had also overtaken Villoresi, meaning the three Maserati cars were left chasing the leading Ferrari of Ascari for first position. On the second lap, Farina would make his way past Bonetto, however Villoresi's Ferrari would be forced into the pits at the end of the second lap. Hawthorn's first race for Ferrari had gotten off to a poor start, he had dropped down to thirteenth position. He was forced to fight in the midfield with the Gordini cars, led by local talent, Menditeguy. The first concerns for safety among the crowd was realised when the Cooper of Schwelm Cruz had an axle failure which caused one of his wheels to break loose and bounce into the crowd. There were further retirements for the Gordini's of Birger and Menditeguy, however the tragedy that was feared to occur came on lap 32. Throughout the race, the spectators had grown ever more wild and daring. As was recounted by Mike Hawthorn "time after time, I waved at them to get out of the way, but this only made them worse.They began standing in the roadway holding shirts and pullovers, which they snatched away at the last moment like a toreador playing a bull”. It was on lap 32 that Farina, continuing to chase the Maserati cars of Fangio and González was caught out by the unpredictability of the spectators. A small boy had darted in front of Farina's car, forcing the Ferrari to take evasive action, losing control of his car at the Curva Nor Este and ploughed into the spectators. It is believed that Farina's crash killed 13 spectators. The hysterical crowd were suddenly panicked, in the pandemonium, Brown's Cooper hit and killed another young boy who had ran out onto the circuit. Juan Perón's national grand prix had turned into a national disaster and following Farina's crash, he had quietly left the circuit. Despite this chaos, the race continued, none of the drivers would willingly withdraw from the race. Ascari continued to lead the race, Fangio, unable to match the lead Ferrari retired on lap 36 with a broken universal joint. His retirement had gone unnoticed by his Argentine supporters, there was little remaining focus on the race. Bonetto had dropped out of the race as well, leaving González the last driver left to lead the Maserati charge. The Ferrari's of Villoresi and Hawthorn had recovered, and had climbed back to third and fourth positions. Manzon in the Gordini was a distant contender, he was racing in fifth place, not too far behind the two Ferrari's ahead of him. Manzon however, would be forced into the pits on lap 43 to replace a degraded tyre. A wheel nut would then jam forcing him out of the race. González continued to attempt to challenge Ascari, however the Maserati did not have as strong a fuel economy as the Ferrari's, and unlike the Ferrari cars he would be forced to make a pit-stop. Following González's stop, Ascari was left unchecked at the front of the field. He would thereafter extend his dominance to lap the entire field. González's pit-stop had also allowed Villoresi to retake second position, putting Ferrari back into a one-two scenario. Ascari would continue where he left off, he had once again dominated the field, however Maserati had demonstrated a renewed challenge. Their car, still suffering from fuel consumption had nonetheless continued to close the gap to the Ferrari cars.